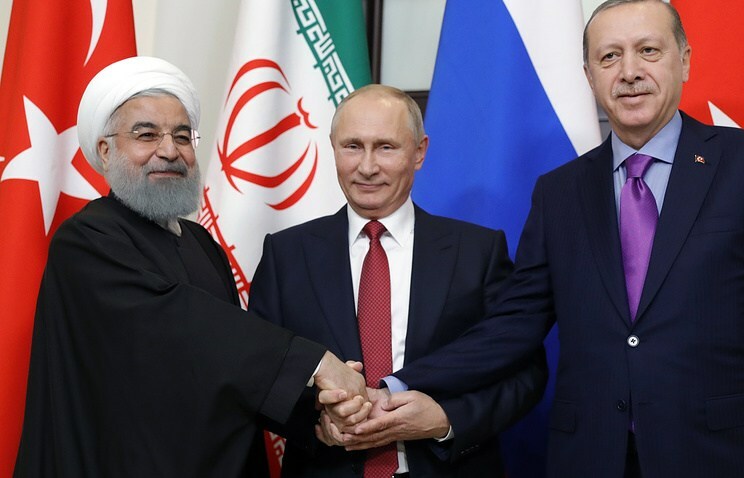 The leaders of Russia, Iran and Turkey are now the primary divers in shaping a post-conflict peace settlement for Syria. 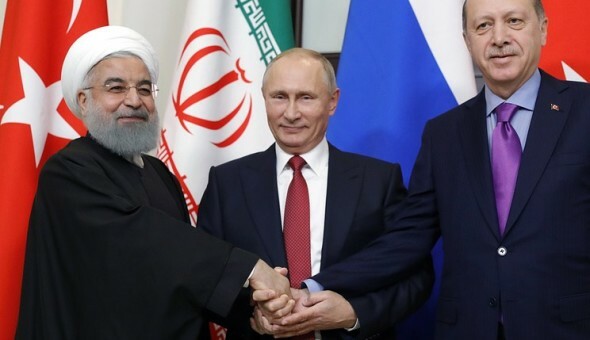 Russian President Vladimir Putin has hosted President Hassan Rouhani of Iran and President Recep Tayyip Erdogan of Turkey in the Sochi to discuss a peace process for Syria. The meeting is part of the Astana format which has previously agreed to create and maintain de-escalation zones in the Syrian Arab Republic. The three Presidents agreed to further their commitments to deeper cooperation over all matters relating to a final peaceful political settlement to the Syrian conflict. President Putin spoke first saying that in addition to cooperating on peace measures, all three countries agree to continue cooperation against remaining terrorist group in Syria, such as al-Nusra (al-Qaeda’s branch in Syria). Once al-Nusra and remaining Takfiri terrorists are neutralised, Putin stated that a “long lasting comprehensive normalisation of the territory of Syria (and) political restructuring of post-conflict Syria” is necessary and that the joint statement by the three Presidents reflects this. Putin stated that is is additionally important for the return of Syrian refugees to a peaceful country as well as for Russia, Iran and Turkey to work with Syria to normalise the situation for internally displaced persons. Putin also restated the commitment of the three countries to the Syrian National Dialogue Congress which will also be held in Sochi. This body will bring together supporters of the Syrian government with opposition fighters and try to foster a penultimate de-escalation and pave the way for new elections in-line with UN resolution 2254. Putin emphasised that the future of Syria must be determined only by the Syrian people. Additionally, Putin stated that Russia, Iran and Turkey must work together to economically revive and rebuild Syria in order to insure a lasting and prosperous settlement. Next to speak was Iranian President Hassan Rouhani. Rouhani stated that terrorism is a universal threat and that no country should ever use it as a political instrument, in a clear rebuke of Saudi Arabia which is currently hosting a shambolic conference of those who remain members of the so-called Syrian “opposition”. The Iranian President further stated that his country wants to encourage a peaceful dialogue between Syria and those who have differences with the government. He reiterated Iran’s commitment to ensuring peaceful and fair elections and that Iran is committed to rebuilding Syria in a post-conflict environment. Finally, Turkey’s President Erdogan spoke. He began by thanking his “friend Vladimir Putin” and thanked God for insuring continued cooperation in all areas in the future. The Turkish President praised the work of the Astana group in creating the de-escalation zones and stated that Turkey supports new elections in Syria based on the principles of UN resolution 2254. …We adhere to the principle of the territorial and political integrity of Syria. We cannot see terrorists as a legitimate side in that process”. Crucially, none of the thee leaders are calling for dividing Syria into separate states nor was the term “federalisation” used in today’s meeting. Previously, Russia had broached the idea of federalism, but Russia appears to be walking away from this position in earnest. Instead, Russia seeks to foster dialogue between cooperative opponents of the Syrian government and the Syrian government. Putin has been very clear that compromises will need to be made on both sides. This demonstrates that there may be room for disagreement between Damascus and Moscow if these discussions are not expertly managed. Syria has always stated that it is willing to both pardon and engage with any Syrian who is willing to renounce violence and embrace a peaceful political process. However, Syria does have its limits when it comes to groups that seek to impose an increasingly crypto-Takfiri agenda on a multi-faith, multi-ethnic, secular Arab Republic. Since no compromise situation is ever 50/50, Russia ought to insure that the so-called “opposition” who are disunited and internally divided, are never allowed to get a pseudo-upper hand in discussions with Syria. Here, one must rely on speculation that during behind the scenes discussions with President al-Assad, that President Putin assured Syria that the victory against Takfiri groups will not be minimised by an overwrought inclusion of crypto-Takfiri groups in a final peace settlement. The reality of this speculation will likely become more clear over the next 2 to 3 months. As for Turkey, Ankara still maintains sympathy for some of the sectarian Sunni so-called “opposition” in Syria, however, while Russia is willing to allow Kurdish militant groups to participate in dialogue with the Syrian government, Turkey is dead set against this. In this sense, Iran can help to assure Syria that Turkey’s position in favour of crypto-Takfiris can and will be restrained, while Iran can also assure Turkey that Tehran will effectively communicate a message of genuine worry over Kurdish terrorism to Moscow. Today’s meeting was not a watershed moment in terms of providing a unified front for a final peace settlement to Syria. As al-Nusra terrorists still remain active in parts of Syria, such a hope was overly ambitious in any case. What today’s meeting did show however, is that those who will establish the penultimate mechanisms of peace will be the governments of Russia, Iran and Turkey. The US and EU by contrast, are far from central to any settlement. Today’s events also demonstrated that Turkey is going to have to be in the same room as pro-Ba’ahist political leaders and deal with the situation maturely while Iran will have to do the same in respect of being in a room with crypto-Takfiris. The situation will have its difficulties, however, it ultimately shows a maturity among the three Astana group powers that countries like the United States, EU powers, Saudi Arabia and most of all Israel, have not shown any willingness to attempt and apprehend. The differences I highlighted were almost certainly discussed in private and sooner or later, they will have to be reasonably dealt with in public. Overall, through all of this, one must remember that the Syrian government has done nothing wrong and just about everything right. There is no need to altar the constitution of the Syrian Arab Republic one iota. However, Syria is willing to engage with the Astana group in the hopes of bringing peace to the country, something which Syria’s leaders have stated is their goal, time and time again. The hope is that whatever constitutional changes are made, that they are in line with strengthening the Arabism, pluralism and progressivism of the current constitution, rather than watering it down, something which would only leave Syria exposed to future conflicts.